Privacy at TNK: Your account privacy is important to us. Any information collected through this site when submitting order information will not be distributed or sold to 3rd Parties. 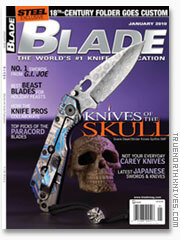 Knives of the Skull - Blade Magazine Cover Knife image of the Strider Spitfire SMF, custom made for TNK by Duane Dwyer. Read the Cover Story, here.